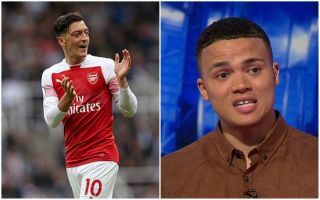 Pundit Jermaine Jenas was still full of criticism for Arsenal star Mesut Ozil despite his winning goal against Newcastle this afternoon. The Germany international slotted in a well-taken winner at St James’ Park to make it three wins in a row for the Gunners and set them on the right path after a difficult start under Unai Emery. Jenas, however, still wants to see more from Ozil, explaining that he didn’t really have his most influential game today. The former Tottenham and England midfielder explained that he still feels Ozil doesn’t really influence games like the best attacking midfielders David Silva and Eden Hazard do for their clubs. Watch Jenas’ explanation below – fair or harsh? "I want him to dictate games, I don't feel he does that. In today's game, it feels like he's got away with one…"
"I can't remember the last time he got hold of a game and ran the show."